Last year I really enjoyed joining in with Le Challenge. Each month the lovely Lucy and Nat set a topic, and the challenge is to make something inspired by that topic and link up on the 15th of the month. I love trying to think out of the box and make something fun, which then usually doubles as a gift for a friend! This month the topic was The Rising Sun. I have to admit that my immediate thoughts were not of Japan or Japanese fabric. Rather they were of birds chirping, being woken by the neighbours sweeping their driveways, motorbikes roaring past without mufflers, and despite all the noise trying to spend some time at the start of the day in prayer. In the end I went with a combination of the two. I made a cushion cover using some beautiful Japanese fabric which I had bought from Alyce last year. Its tenuous link to my thoughts of early morning was this panel. How I wish the sun would rise at 8am, and not at 5am! And how I wish my Indonesian neighbours wouldn't feel like they needed to wake up and start making noise at 5am! It is something that I still haven't got used to about life here! I made a concealed zipper for the back, and love this Lecien print. This cushion is a gift for a Librarian friend so I think she will enjoy this! and with the Pillow Collective at Amy's, where you can find some great tutorials for making pillows/cushions. Neat. Not so the 5am. I like this challenge as well. It is cool to see what others made for the same theme. You should have told me you finally made a blog! Love the print for the back, I also did not first jump to the thought of Japan, but of the sun shining, will hopefully show mine tomorrow :) Happy Valentine's Day. Nice cushion! I love the selection of fabrics you have chosen, especially the one on the reverse of the cushion - I have never seen anything like that before. Your pillow is beautiful and perfect for my couch! Lucky friend I say, wish it were me! 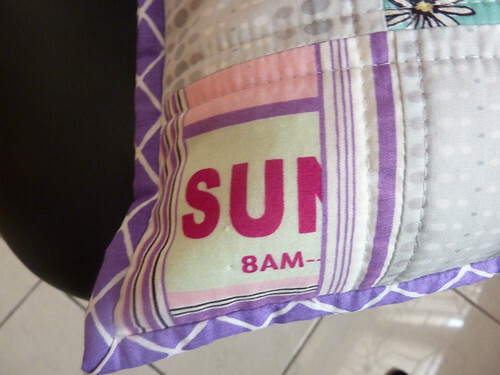 Love the pillow, and little sun peaking in the he corner. Your friend will love it. Thanks for participating in le challenge. I'm sure your friend will love this.... I don't do mornings very well, I thought there was only one 5 o'clock in the day! 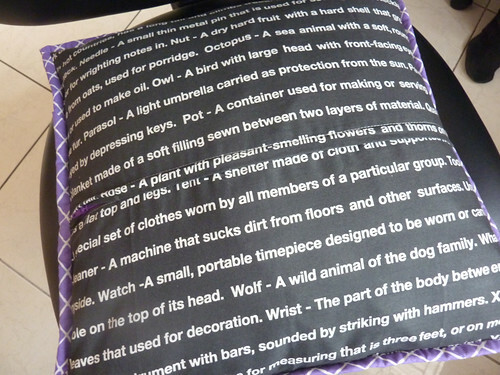 I love your cushion, if your friend doesn't I a work in a library and could give it a home! My thoughts on rising sun were more along the lines of yours. 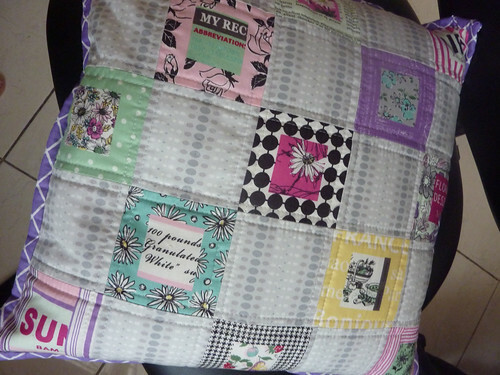 It's such a pretty cushion with those great fabrics! Love the backing. And the dashing you used compliments the the pretty pieces perfectly. Oh that backing fabric is very cool! I'm sure she's going to like this pillow! The front has a retro feel to it and I love that shade of purple! Lovely cushion I love the backing fabric. I'm sure your friend is going to love it. This is a really lovely pillow!! And I LOVE the backing!! What a lovely pillow! The fabrics speak of softness and restfulness to me. Ohh I nearly missed this post, I'm glad i didn't because I love your pillow!! I particularly like the purple binding. How wonderful for your librarian friend to receive it as a gift.